Jerome Williams reacts on the mound as Travis d'Arnaud rounds third base after hitting a solo home run in the third inning Wednesday night in New York. NEW YORK — Travis d'Arnaud homered after assuming David Wright's spot in the lineup, Lucas Duda also went deep and the Mets defeated the Phillies 6-1 Wednesday night for a three-game sweep in their first home series this season. Jonathon Niese pitched out of trouble for 6 1-3 innings and helped himself with a run-scoring single. Duda hit a long homer and an RBI double as the Mets won their fourth straight, a few hours after putting their captain on the 15-day disabled list with a strained right hamstring. Wright was injured while stealing second base the night before and is expected back within three weeks. In his absence, d'Arnaud moved up to second in the batting order and broke a 1-all tie in the third with a leadoff shot down the left-field line. Duda hit the first pitch in the fifth from Jerome Williams (0-1) over the original wall in right-center at Citi Field that is 415 feet from home plate. Juan Lagares had an RBI single, and the Mets got another run on a throwing error by third baseman Cody Asche. 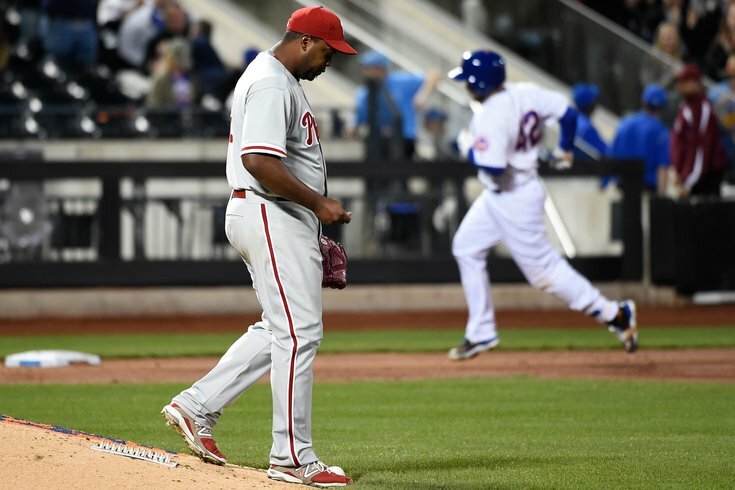 Niese (1-0) worked around nine hits and two walks in his second start as the slumping Phillies had their latest miserable performance with runners in scoring position. Philadelphia has dropped four in a row overall and 20 of its past 26 meetings with the NL East rival Mets. Asche, on an early tear at the plate, had three hits and a walk. Rookie center fielder Odubel Herrera had three extra-base hits, including his first career triple. Herrera opened the game with his three-bagger to right-center and scored on Chase Utley's groundout, but that was all the Phillies could muster. Williams gave up five runs — four earned — and 10 hits in five innings. The journeyman right-hander was coming off a fine outing against Washington in his first start of the season. Phillies: OF Domonic Brown (left Achilles tendinitis) has been rehabbing with Class A Clearwater and is getting close to having his assignment moved to Triple-A Lehigh Valley. "I'm not sure if it's today or tomorrow. It could be that soon," manager Ryne Sandberg said. "The plan right now is to get some upper-level at-bats." ... RHP Chad Billingsley (elbow surgery) pitched five scoreless innings of two-hit ball Wednesday morning in a rehab start for Lehigh Valley against Syracuse. "Progressing well," Sandberg said. Mets: Cleanup hitter Michael Cuddyer was back in the lineup after leaving Tuesday night's game when he was hit by a pitch on the left hand. ... New York closer Jeurys Familia was unavailable after earning three saves in three days. ... SS Wilmer Flores was rested in favor of Ruben Tejada. ... Eric Campbell was recalled from Triple-A Las Vegas to replace Wright at third base. Campbell singled in his first major league at-bat of the year. Phillies: LHP Cole Hamels (0-1) makes his third start of the season Thursday night at Washington in the opener of a four-game series. Hamels, who is 15-8 with a 2.59 ERA in 33 outings vs. the Nationals, allowed one run and two hits over seven innings against them last Saturday. Doug Fister pitches for Washington. Mets: The opener of a four-game series Thursday night against visiting Miami, with RHP Dillon Gee (0-1) facing Jarred Cosart (0-1). Gee is 3-1 with a 2.84 ERA in six starts against the Marlins and has not given up a home run to them since Aug. 29, 2011. He has held Giancarlo Stanton to one hit (a homer) in nine at-bats.